In the second pylon the vestibule of Horemheb , finished by Ramesses II and cased Ptolemies III and IX, leads into the immense Hypostyle hall (103 by 53M), erected by Seti I with additional decoration by Ramses II. The fine raised relief of Seti's can be seen in the northern half, contrasting with the cruder but still graceful , sunk relief of his son in the rest of the hall. The Hypostyle hall was restored after several columns in the north-east corner collapsed in 1899, originally there were 13:12 open columns, 22m high, along the central aisle, and 122 of the smaller closed for bundle papyrus columns (nearly 15m high) in the rest of the hall, the entire structure was roofed with stone slabs, light being admitted through clerestory windows that ran along the nave at the centre of the hall. There is quiet a lot of colour still left on the upper part of the columns and on the roof slabs still in position, the north side of the hall was decorated by Seti I in delicate raised relief, and the south side by Ramesses I, whose artists abandoned the raised style for the less time-consuming sunk relief. The columns have been inscribed by several kings starting at the top with the vertical car-touches of Seti and at the base by Ramesses II. Ramesses IV and VI also inscribed them, the order being the same in the each case. The central part of the column is taken up with offering scenes, the king before the deities of the temple and those of Egypt in general. On the inside wall of the second pylon Seti is shown followed by Khonsu and led by Hathor to Amon-Ra. 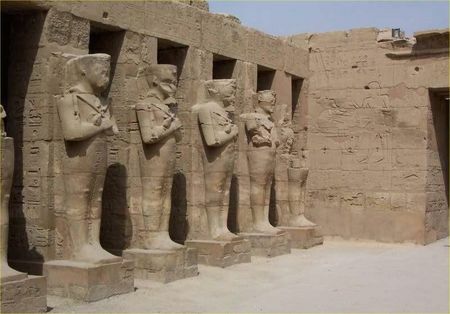 Further north on the same wall are shown Ramesses I before eight divinities Seti I kneeling before Seth and Nephtys, and Ramesses I before Hours and Hathor. In as lower register Seti I is shown wit four bulls before Amon and Hathor , the king is also shown before Amon-Ra Kamutef, with Nubian climbing poles, on the south side of the north wall are some very delicate scenes of Thoth writing Seti's name on the sacred ished tree, while the king kneels before him, on the fare side of the door the king receives a sceptre, and offers vases to Amon-Ra. On the front of the third pylon there are a further 37 scenes if Seti before the gods receiving serpent sceptres from Mut, pouring libations on an altar, and making offering in which Ramesses II joins him. The scenes outside on the north wall show Seti's Syrian and Palestinian campaigns, including the capture of the city of Yenoam, the king driving in his chariot, offering prisoners to Amon-Ra. 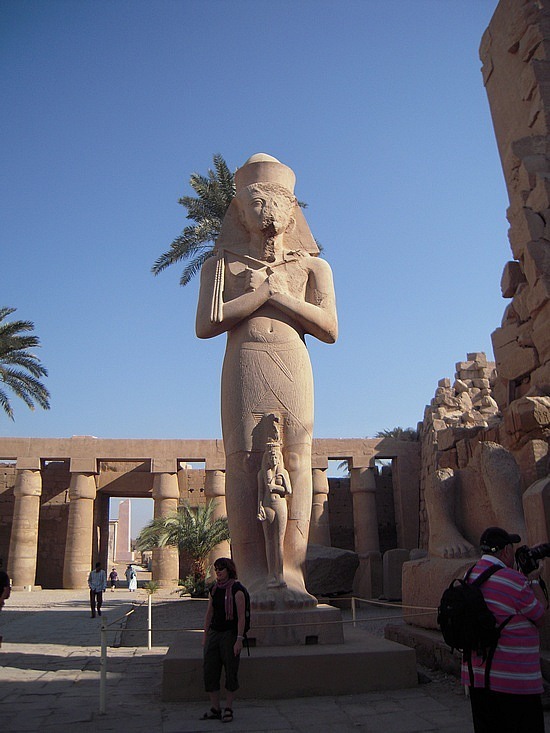 The third pylon was erected by Amenhotep III. In the foundations were found several dismembered earlier shrines, some complete. They included a limestone chapel of Senusert I, an alabaster chapel of Amenhotep, parts of quartzite shrines of Hatshepsut and sections of alabaster shrines of Amenhotep II and Tuthmosis IV. On the east face is a long text of Amenhotep, listing tribute while scenes show the sacred boats of the gods. 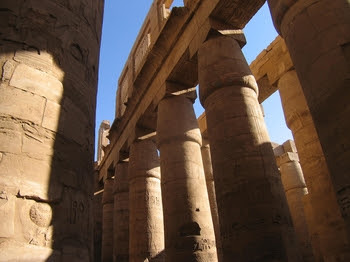 From the Hypostyle hall two other temples can be visited North east against the enclosure wall is the temple of Path and in the south corner of the enclosure the temple of Khonsu.Between the third and fourth contained four obelisks, but only one is now standing. The two vases nearest the pylon held obelisks of Tuthmosis III and the blocks are scattered around the court. Beyond these are the bases of the two obelisks of Tuthmosis I, of which the southernmost if still standing, Ramses IV and VI, the blocks of the other obelisks are lying on the ground.